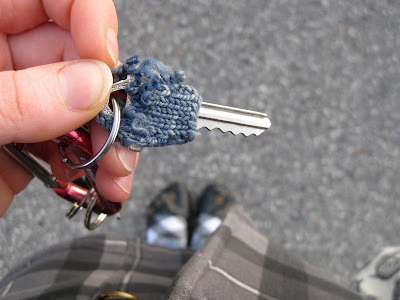 As I was walking out to my car tonight, I noticed that my key cozy is coming unraveled! Sometimes even the best crafts bite the dust. I guess it's not surprising considering I made it about a year and a half ago. Most often, it's a very sad day when a beloved knit starts to come apart. But this is such an easy pattern (I did make it in about 20 min after all) that I just might have to make myself another! And now I'll get to have it in a new colour! Update: Crocheted version of key cozy is done and posted about here! awww! and your outfit (socks and coat) are freakin adorable!! Do you have any idea how I could convert this pattern to crochet? I can't knit to save my life! But I love this pattern!! Interesting idea for a crocheted pattern. I'll try to make one! When you make a crocheted pattern, I would love to get a copy of it! This is such a great idea for all my bits and pieces of leftover yarn!